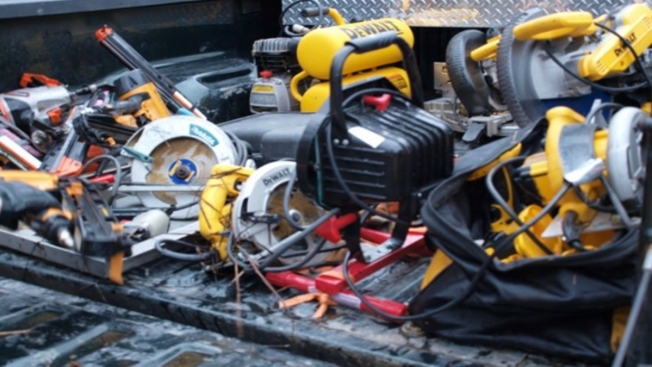 Police say they've recovered more than $40,000 worth of stolen construction equipment, power tools, a golf cart, and other items, some of which were found in ponds in New Hampton and Meredith, New Hampshire. Police say Fish and Game Conservation Officer Josiah Towne went into the frigid water to recover the property. No arrests have been made, but police say their investigation has uncovered a "large theft ring" in central New Hampshire, identifying victims from Meredith, Bristol, Bridgewater and Plymouth. Some items were recovered from an abandoned piece of property in Meredith and a home in Bristol. Other recovered items include landscape equipment and horse and dump trailers.